The prompt for this weeks mani was “What do you want to be when you grow up?” the option was open to have it depict what your kiddo wants to be. During my daughters first few weeks of pre-k this year, they asked her that very question. Her answer was that she wanted to be a mommy, an inventor and a mermaid. I went with the most whimsical of those for this mani! This was a really technique-heavy mani and the detail work, while not super difficult itself, was time consuming. I’ve used this scale technique before and I just adore how it looks. 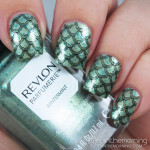 I first saw it in a tutorial by @little_nails in her Mermaid Nails Tutorial – so check out the link if you want the down low on how it is done. To start this mani off, I painted on one coat of Barielle – End of the Rainbow. It was a bit darker than I wanted, so I covered it with one coat of OPI – Don’t Touch My Tutu. When my nails were dry to the touch, I double stamped a water pattern on them using M Polish – Snowberry and Starflower, using Bundle Monster – BM-XL25. Here is where the work gets to be a bit more intense. Using a long striping brush, I dipped into Color Club – Abyss and created clean, wavy lines across my nails. I wanted the lines to be very precise, so careful placement was necessary. Using the polish brush, I painted from the line, toward the tip of each nail with Abyss. It is a dark turquoise color that serves as the backdrop for the scales. Once that was dryish, I started in on the dotting. I started on the right-hand side of each nail and worked my way left so that the scales would look properly overlapped. I was working with about 7 colors, so I had to clean my dotting tool after each dot was made. Whew! 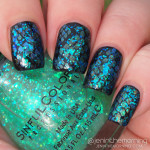 Once I had the scales done on each finger, I used OPI – Love.Angel.Music.Baby and a long striper brush to re-trace my original wavy lines, which added some distinction between the scales and the water. I coated everything with 1 coat of Seche Vite to seal them and aid in drying time and Voila! Below is my complete list of polish I used. It’s a ton lol! Overall, I was absolutely thrilled with how these turned out! It was very time consuming, but at the end, when everything worked out exactly I had envisioned, I did a bit of a jig. LOL!